Olde World Sailing Line – Come sailing with us! 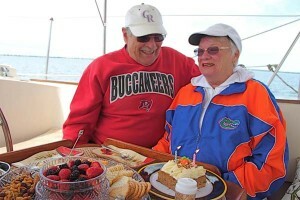 Join us on a luxury sailing cruise on beautiful Tampa Bay aboard the S.V. Lionheart, a classic 44’ ocean-going sailing yacht. From the moment you first see Lionheart, you will understand that this is much more than an ordinary boat ride. This is not your typical sailboat. She seems part pirate ship, part Yankee clipper, and all luxurious sailing yacht fully capable of sailing every ocean of the globe in ultimate safety and comfort. Prepare to be pampered, whether you choose a romantic Sunset Cruise, a private Concierge sail or an elegant 3-Course Dinner Cruise customized to best meet your needs and schedule. Olde World Sailing Line cruises are a tribute to the glory days of our seafaring heritage, the epitome of luxury and indulgent First Class service. The Lionheart departs by reservations from downtown Tampa. Visit the heart of Tampa’s downtown waterfront with convenient parking, first class dining, and the city’s major attractions along the brand new River Walk. On the way out to the bay, you’ll see Tampa as you’ve never experienced it before as well as Florida’s largest port, the Port of Tampa. Every Olde World Tampa Bay Sailing Cruise features elegant hors d’ourvers, a wide range of refreshments, First Class service, and live harp sea shanties performed by a national award-winning orchestra musician. The choice will be yours – take the wheel, hoist a sail, or kick back in one of Lionheart’s easy chairs, put your feet up on the railing and relax. Sunset Sail – Departure 2-hours before sunset. Three hour cruise returning after dark. Concierge Sail – Your own private yacht for a pampered three hour cruise. Full Moon Experience – After sunset, see the full moon rise over the water in a magical display.